Mediterranean food has a special place in my heart. Having spent many summers in Spain, eating way too much paella and tapas, I have fallen in love with their laid back, sharing way of eating. I love the social aspect of everyone sitting around a table together, sharing drinks and food and everyone getting to try a little bit of everything. There’s something more jovial, more relaxed about the atmosphere. The meal becomes just as much about the company as about the food. My Dad and I share this love of tapas and he took me along to a great little tapas bar, Copita, for a great birthday lunch last month. Running with the laid back theme of the food, Copita doesn’t have individual tables but bar style seating throughout contributing to the relaxed vibe. We decided to order four plates between us and then see if we fancied anything else after that. The food doesn’t come out all at once but one or two dishes at a time so you can really appreciate each dish without being overwhelmed by everything at once. 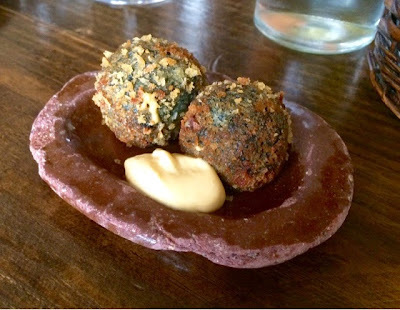 We began with cuttlefish croquettes which were really smooth and creamy and a gorgeous deep inky black colour inside with a really good strong flavour which was paired perfectly with the cool aioli which just took the edge off it being too strong. An excellently balanced dish. We followed up with yet more seafood ordering tiger prawns and an octopus dish. 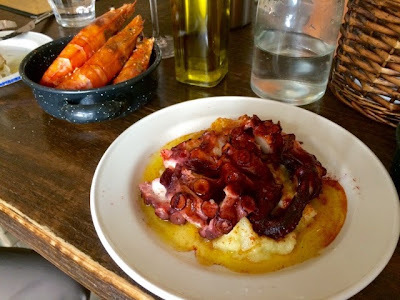 The octopus was lovely and meaty and perfectly grilled and the creamy bed of potatoes was perfect for mopping up with their lovely rustic bread. Make sure you order bread as there are loads of lovely juices in the dishes for it to be dipped in, as was also the case with the absolutely enormous prawns. Be prepared to make a mess! These are served whole and you’ll have to get stuck in with your hands to extract all the juicy meaty flesh inside. I got through an awful lot of napkins but it was totally worth the effort. 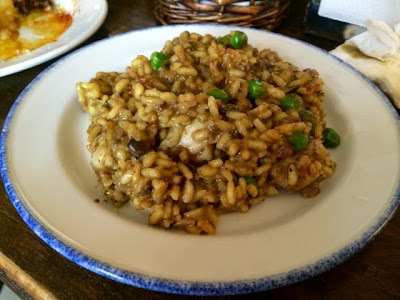 After our seafood extravaganza we went for something still a little unusual with a paella style rice dish with rabbit and mushrooms. Rabbit is a very popular meat in Spain but not something you see over here that often so it made a really nice change. This was a delicious earthy and rustic dish which made a great contrast to our previous dishes. After devouring all of this, we ordered a cheeseboard to finish off the meal, that I completely forgot to photograph. It rounded the lunch off perfectly. Featuring the classic Spanish manchego, a blue cheese and something creamier, that I’m not sure what it was, in the middle this was a good all rounder. In hindsight would have gone really nicely with one of the charcuterie boards on the menu, but by this time we couldn’t squeeze in any more. Copita may not be inexpensive enough to enjoy as an everyday casual lunch but if you’re looking to enjoy a really good meal, some tasty really great quality food in a relaxed and friendly environment, I’d thoroughly recommend it. This would be a great place to bring a date as the interesting menu and trying new things makes for a great talking point with the atmosphere keeping everything really relaxed. I really want to bring The Boyfriend here for a date night.